Cardiac magnetic resonance T2*-quantification in the mid-ventricular septum is a valid method to assess myocardial iron overload . However, in non-midseptal heart segments, T2*-quantification is compromised by macroscopic susceptibility effects [2, 3]. We studied the intra-, interstudy and inter-observer reproducibility of circumferential myocardial T2* measurements in normal individuals and evaluated reduced slice thickness and a z-shim technique  on their potential to reduce susceptibility artefacts. 8 healthy volunteers underwent a cardiac 1,5 Tesla-MR-examination twice (Siemens Avanto). Within a single breath-hold 8 echo images with TEs from 2.3 ms to 18.6 ms were acquired with a multi-echo gradient echo sequence. Slice thicknesses of 8 and 6 mm were used. For the z-shim technique 11 acquisitions were performed on 8 mm slices with compensation moments between -M0 and M0 added to the exact rephasing moment M0. T2* calculation (a mono-exponential signal decay was assumed) and ROI analysis was performed in Matlab (The MathWorks, Inc., Natick, USA). Z-shim corrected images were calculated using a maximum intensity (MIP) as well as a square root of the sum of squares (SSQ) method. Statistical analysis was performed in SPSS (SPSS 14.0 Inc., Chicago, USA). The intra-study coefficient of variation (CoV) of midseptal T2* in 8 mm slices was 7.5%, inter-study CoV 6.8% and inter-observer CoV 6.0%. 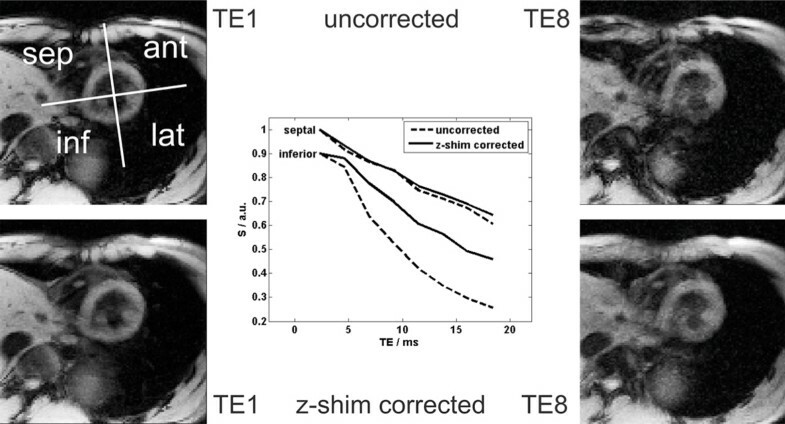 Both slice thickness reduction and z-shim-application resulted in less negative percentual deviation from the 8 mm midseptal T2* value for the lateral and inferior segments (Fig. 1), indicating less signal decay (Fig. 2). Moreover, circumferential homogeneity is improved, especially by the z-shim-SSQ technique. On the other hand slice thickness reduction resulted in an increase of midseptal CoV from 6.8% to 13.2% (p = 0,161). After z-shim application, larger deviations from the 8 mm midseptal T2* were measured for all except lateral segments (Fig. 1). Compared to the MIP approach, deviations were smaller using the SSQ technique (p = 0,042). Circumferential T"-variation. Circumferential T2*-quantification is compromised by susceptibility effects. We aimed to evaluate the effect of slice thickness reduction and a z-shim technique on susceptibility-related signal loss. Both techniques resulted in better T2*-homogeneity, at the cost of SNR or scan time, respectively. Uncorrected (top) and z-shim corrected (bottom) first and last echo images. The corresponding signal decays over all echo times in septal and inferior segments are shown in the centre. Our reproducibility-data on myocardial T2*-quantification in healthy volunteers resulted in intra-, inter-study and inter-observer CoV comparable to literature standards [5, 6]. Diminishing field variations across the slice by reducing its thickness resulted in slower signal decay for the lateral and inferior wall, but at the same time in a decreased inter-study reproducibility. This is most probably due to lower fit quality, caused by a lower signal to noise ratio. Additional gradient moments in slice direction enabled signal recovery especially in lateral and inferior segments (Fig. 2), improving circumferential T2*'-homogeneity. 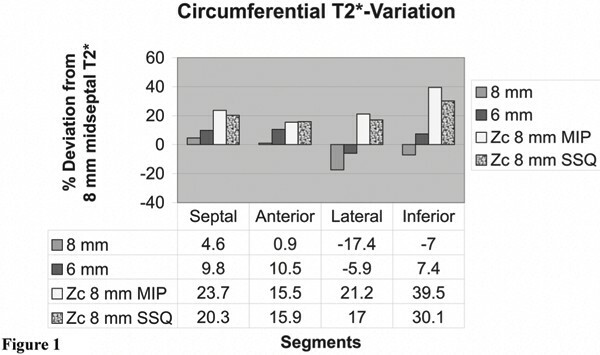 However, it has to be clarified why falsly high T2* values were obtained mainly in the inferior segment after signal combination using MIP or SSQ techniques. In future T2*-quantification studies, the application of an optimized set of less compensation moments in combination with parallel imaging techniques might allow single breath-hold z-shimmed acquisitions, reducing errors caused by cardiac motion.